Umm... so I know I don't have a huge following or anything, but I'm hoping someone out there in the internets can help me with this, because I'm stuck. One day, my two boys were messing around, being crazy, and swingin' from the chandelier. No, really. They were literally swinging from the chandelier above my bed. 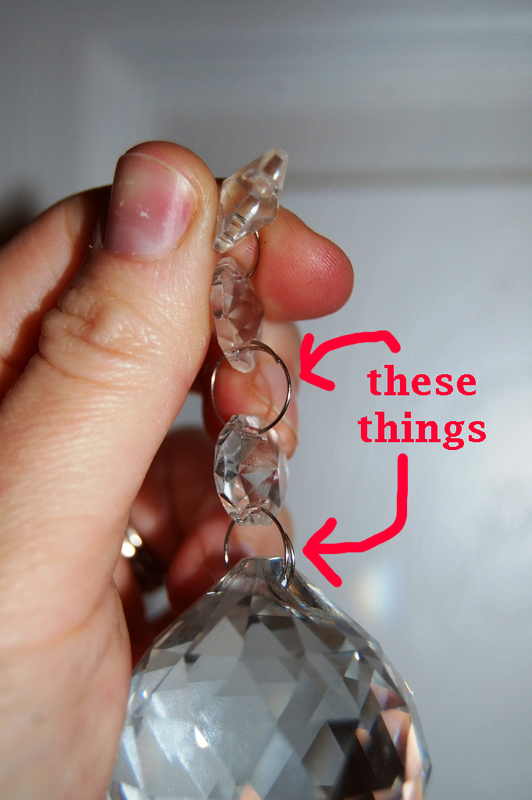 Nothing expensive and/or pretty was broken during the making of the mischief, but they did bend several of the metal rings connecting crystals -- and even lost one. Please don't look at my hand too closely. I'm sure I need a manicure or some lotion or something. Anyway, my question is... does anyone know where to buy these?? The closest things I've found are these paper key tags, but I don't think the metal rings are the same size. I want to fix this as subtley as I can, since the big dangley thing that's no longer attached to my chandelier happens to be the middle, largest-of-all crystal dangley, so it's noticeable. Blerg. What about, like, the jewelry section of a crafty-type store? 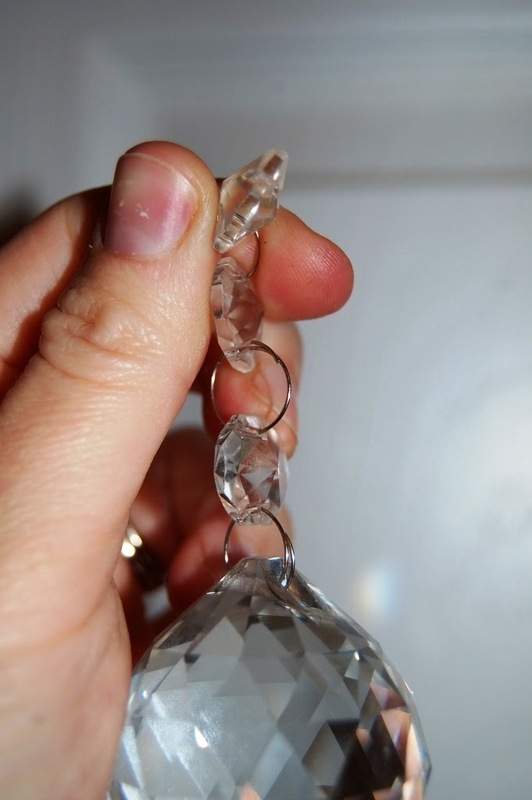 I've been looking to buy crystals for a chandy makeover, and there are websites you can order from, but you'd probably have to buy eleventy thousand of them if you went that route. Find a place where you get those little key rings for attaching your car unlocker to your keys. Hit the jewelry section like Cara suggested. Lots of ring things there! Anna, try a locksmith shop. Those items are a small wire ring that they use to hold multiple keys, and other such items. I probably have a few floating around the house. My first thought was to get wire from the craft store and make your own. You could take this in to see what gauge you need. Then you could use the remaining wire for fun projects around your home! Good luck!